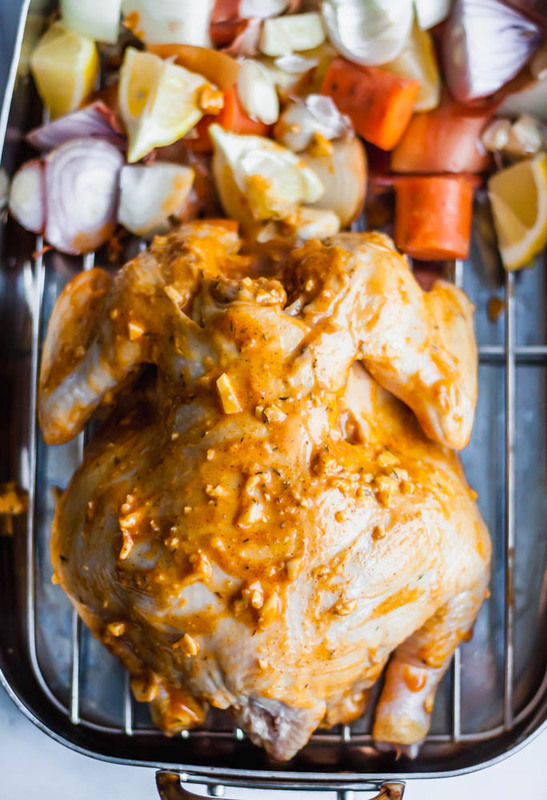 Showing you How To Roast the Juiciest Whole Chicken so you can do it easily at home in the oven with lots of juice and flavor. I am so proud of myself for finally posting this! Gah, it’s been a long time coming. I try to be like a sponge in public and jot down the things friends and family ask me about preparing food. 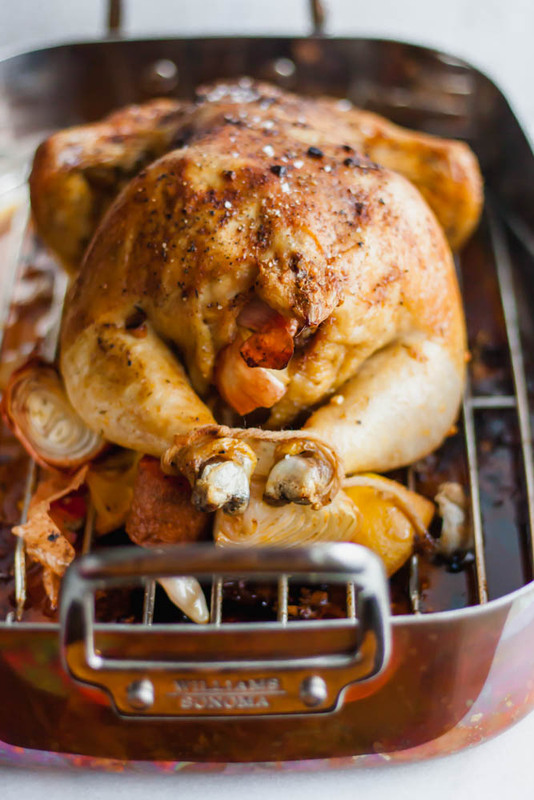 Roasting a whole chicken is among one of the more popular subjects. How do you do it, what temperature does it need to be at to be done, how do you prevent dryness, what do you do with the leftovers? All GREAT questions. These are also questions I get about chicken thighs, learn how to make those here! 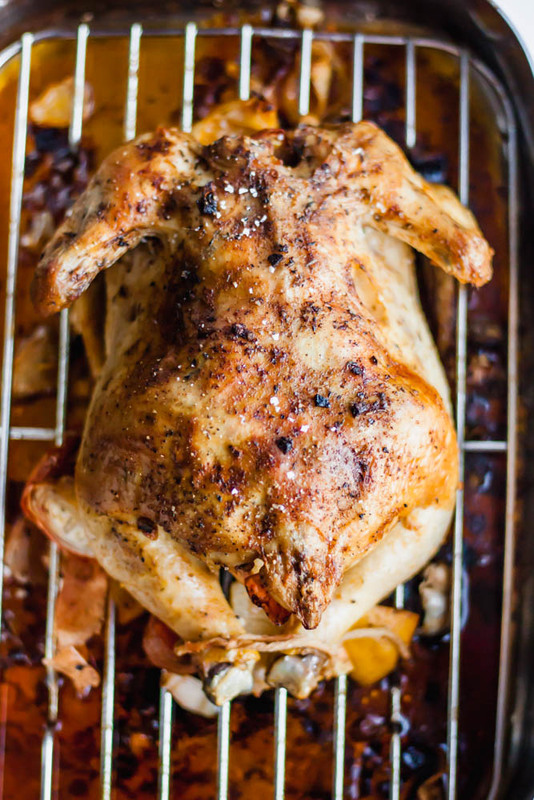 So, how do you make a great, roasted chicken? I’m going to go step by step with the directions below, you’ll see some progress photos and the final product. I use a really yummy blend of herbs and spices, but I bet you have all of those ingredients in your pantry. The trick to great flavor is really enough fat (butter or ghee & EVOO are what I use), and enough seasoning. Salt and pepper are important! 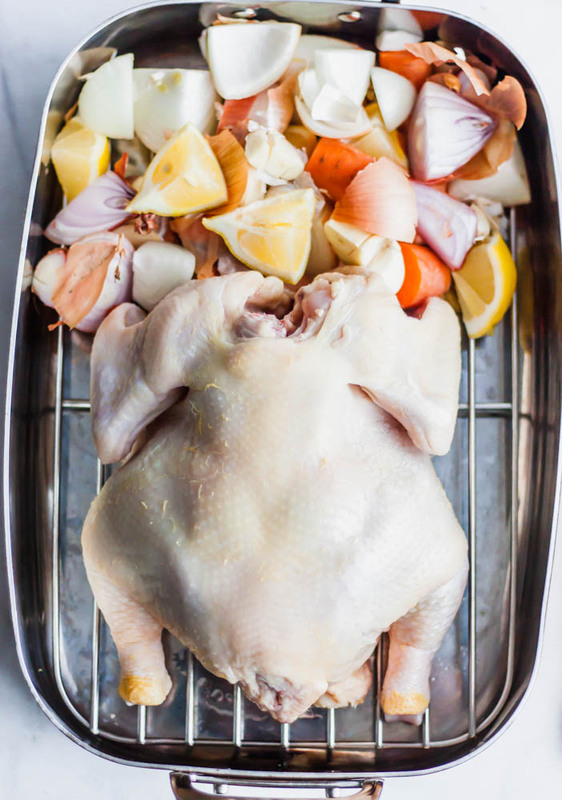 I promise this will be SO easy and the next time you see whole chicken on sale at the store, snag one or two and make this for your meal prep, or to impress guests. Also – DO NOT THROW OUT THE BONES. Make my bone broth recipe with the remains to get some bang for your buck, people! First, lay your bird breast side down on the baking rack and get out your aromatics. Then, over the bird with fat and flavor. Stuff with the aromatics and tie it up. And then bake to perfection! 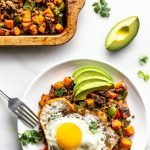 WANT MORE EASY, HOW-TO RECIPES LIKE THIS?? TRY OUT MY GOLDEN RAISIN SKILLET CHICKEN THIGH DINNER OR MY WHOLE30 ROMESCO CHICKEN EASILY! You’re going to be a pro in no time at all! Mince 4 cloves of the garlic and add them to a small bowl with the softened butter/ghee, olive oil, thyme, paprika, garlic powder, salt, and pepper. Mix this well. Take the chicken out of the packaging and rinse it well, removing the gizzards from the cavity. Set those aside for broth/stock or another use. Pat the chicken dry and place it breast side down in a roasting pan. If you have a roasting pan with a wire rack – use it. Take the butter, oil and spice mixture and begin to rub it all over the chicken, in between the skin and inside the cavity. Use up every last bit! Quarter the lemon and onion and smash the remaining garlic cloves. Squeeze the lemon all over and in the chicken and stuff the onion, lemon and garlic into the cavity. Tie the legs together to seal in the aromatics with the kitchen twine. Refer to the pictures for reference. Place the pan in the oven for 30 minutes before dropping the temperature to 350 degrees. This encourages a nice, crispy skin and locks in moisture. Let the chicken bake for an additional 30 minutes before covering with foil. 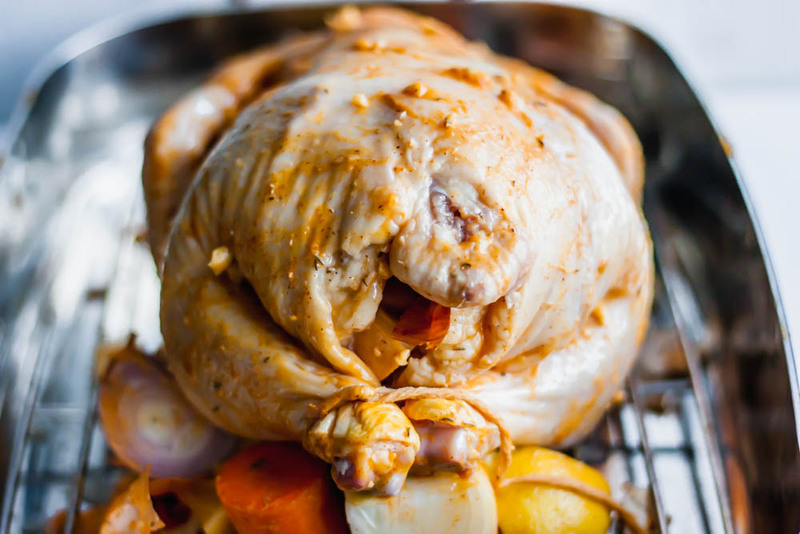 Once the chicken is covered in foil, roast for an additional 30 minutes before checking the internal temperature with a thermometer. Your total cook time will be about 1 hour and 30 minutes, depending on your bird and oven. To test the chicken for doneness, insert a meat thermometer into the side of the thigh. When the internal temperature reaches 160 degrees and the juices are running clear, you’re all done! Let the chicken rest for 10-15 minutes before carving and serving. 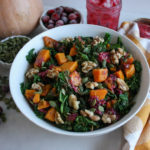 This post was published in March 2018 and was updated February 2019.